BEIJING- When Andrew Wheating stepped onto the track at the National Stadium tonight (local time), he just smiled in amazement. The 20-year-old never expected to be competing at the Olympics this early in his career. But when he finished his 800 meter preliminary heat in 1 minute 47.05 seconds and failed to advance to the semifinals, it wasn�t quite the ending he imagined to his first Olympic experience. Wheating placed 25th overall in the first qualifying round. The only American to reach the semifinals was Nick Symmonds, who won his heat in 1:46.01. Having just finished his sophomore year at the University of Oregon, Wheating could be a contender in the 800 at the 2012 London Olympics. Next time around, he will probably enter a few more races between the trials and the Olympics, so he will be sharper for the early rounds. He knows he still has a lot to learn about the sport and race experience helps. After all, he didn�t seriously pursue track until his senior year at Kimball Union Academy in Meriden, N.H. He has been rapidly rising through the ranks of US distance runners ever since, finishing second in the 800 at the US track and field trials in a personal best 1:45.03. 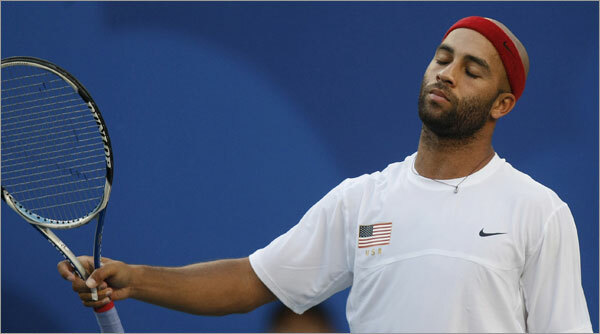 BEIJING -� The Olympic spirit has been broken for James Blake today at the Olympic Green Tennis Centre. After holding serve to take s 9-8 lead in the deciding set, the eighth-seeded Blake hit a shot that was headed directly towards the 12th-seeded Gonzalez. Gonzalez was close to the ball that landed out of bounds. However, it appeared the ball deflected off the handle of the Chilean�s racket and then fell out. The umpire ruled that the point in favor of Gonzalez, which enraged Blake. Blake then raced to the chair umpire to plead his case. Replays show that the ball did graze the racket. BEIJING -- Competing in his first Olympic Games, Brady Ellison (Glendale, Ariz.) shot a score of 664 to place 15th and lead the US contingent in men's archery competition at the Olympic Green Archery Field in Beijing Saturday afternoon. Butch Johnson (Woodstock, Conn.) shot a 653, good for 40th place, just one point ahead of teammate Vic Wunderle (Mason City, Ill.). All three archers advance to the elimination round on Wednesday. In the team competition, the men placed 10th out of 12 teams and will vie for team honors on Sunday, with competition scheduled to being at 10 p.m.
Click here to check out more local athletes who will be competing in Beijing.